WASHINGTON, D.C., April 24, 2018 — The next generation of energy-efficient power electronics, high-frequency communication systems, and solid-state lighting rely on materials known as wide bandgap semiconductors. Circuits based on these materials can operate at much higher power densities and with lower power losses than silicon-based circuits. These materials have enabled a revolution in LED lighting, which led to the 2014 Nobel Prize in physics. 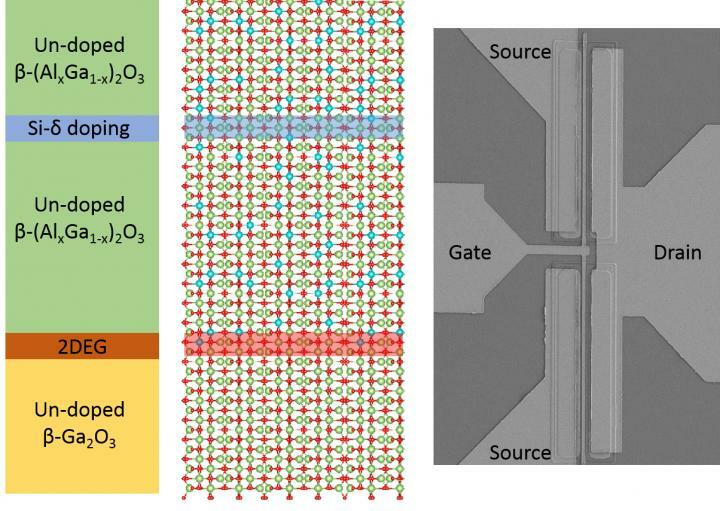 In their work, the researchers created a so-called semiconductor heterostructure, creating an atomically perfect interface between Ga2O3 and its alloy with aluminum, aluminum gallium oxide — two semiconductors with the same crystal structure but different energy gaps. A few nanometers away from the interface, embedded inside the aluminum gallium oxide, is a sheet of electron-donating impurities only a few atoms thick. The donated electrons transfer into the Ga2O3, forming a 2-D electron gas. But because the electrons are now also separated from the dopants (hence the term modulation doping) in the aluminum gallium oxide by a few nanometers, they scatter much less and remain highly mobile.